Strawberry season is in full swing, and we've got the best and easiest strawberry jam recipe for you! It's simple to make, keeps well and is absolutely scrumptious in sandwiches and desserts. 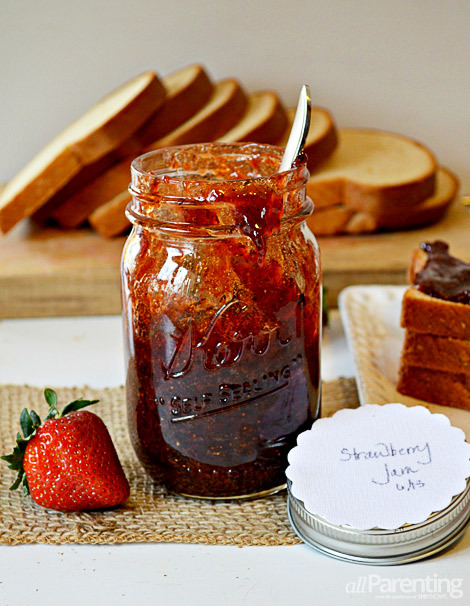 If you've ever wondered how to make strawberry jam, this recipe is for you! The family that makes strawberry jam together, well, gets messy together. But this is the sweetest version of messy there is! Homemade strawberry jam is a delectable sign of summer, and the warm smell in your kitchen is the stuff that family memories are made of. Smooth and rich, it's an absolute treat on warm scones, crispy toast and fresh sandwiches or drip it warm on cool, creamy ice cream. And just between us, it's also perfection eaten straight off of a spoon. Strawberry jam is also incredibly simple to make. With just three ingredients and less than 15 minutes of active cooking time, we're calling this recipe a win! Place the strawberries, sugar and lemon juice in a heavy saucepan. Bring the mixture to a rolling boil, and then reduce the heat to medium-low. Keep the jam over the heat, continuing to stir and mash it, for 30 minutes. Your jam will reduce and a foam may form. After 30 minutes, turn off the heat on the jam and place your Mason jar and lid in the dishwasher for approximately 10 minutes. This will bring the jam and the jar to just about the same temperature avoiding jar breakage and will help your jam keep longer. Now simply fill, seal and label your jar of homemade jam! Your fresh strawberry jam will keep in the refrigerator for up to two weeks. It also freezes well if you happen to have any left, which we never do. Also, if you're feeling adventurous, consider combining equal parts of a variety of berries — blackberries, blueberries and raspberries are lovely — or even adding a mint leaf, a cinnamon stick or a jalapeno to the mixture as it boils. Simply remove your clever addition before filling your Mason jar for a fun variation on a classic favorite! And last, your jam will thicken a bit in the refrigerator and may need to sit out for a few minutes before spreading. You can also microwave the jam — 30 seconds at a time — to make a sweet, warm topping for scones or ice cream!